The meaning of Shi Zen Karate is “to remain natural and in accordance with Nature’s intended way”. At first movements will be stiff and awkward, but with a dedicated heart and spirit the body will find its natural way of moving. The Shi Zen system aims to help overcome difficulties whilst developing your natural abilities in motion. Our bodies move best in a relaxed state, developing this relaxed state both physically and mentally we are more able to respond to changing circumstances. For example, attacks from differing angles, combinations and distances, in Shizendo we call this relax state the flow as speed is not made artificially, its made naturally. Our minds can function with greater clarity when in this natural state helping us to see things clearer, giving us the ability to respond instantly, because our minds move our the body. Every physical action starts with a thought. The Kanji is an encompassing term which is reflected both physically, mentally and emotionally, all movement are subject to the laws of nature. Tapping into this natural state is the subject of shizendo training.”Do”. Translates as the way When this is used as a suffix to a particular style of Japanese martial arts, it is indicative of more than just a means of combat. Do indicates a discipline and philosophy with moral and spiritual connotations, the ultimate aim being enlightenment through personal development. Translation of the Mon The classics say “look for the straight line within the circle” – this is depicted by the eight triangles pointing outwards placed within the circle. This implies that our movements revolve to blend with an incoming force, and by directing our response to the closest point on our opponent we can neutralise an attack the straight line. 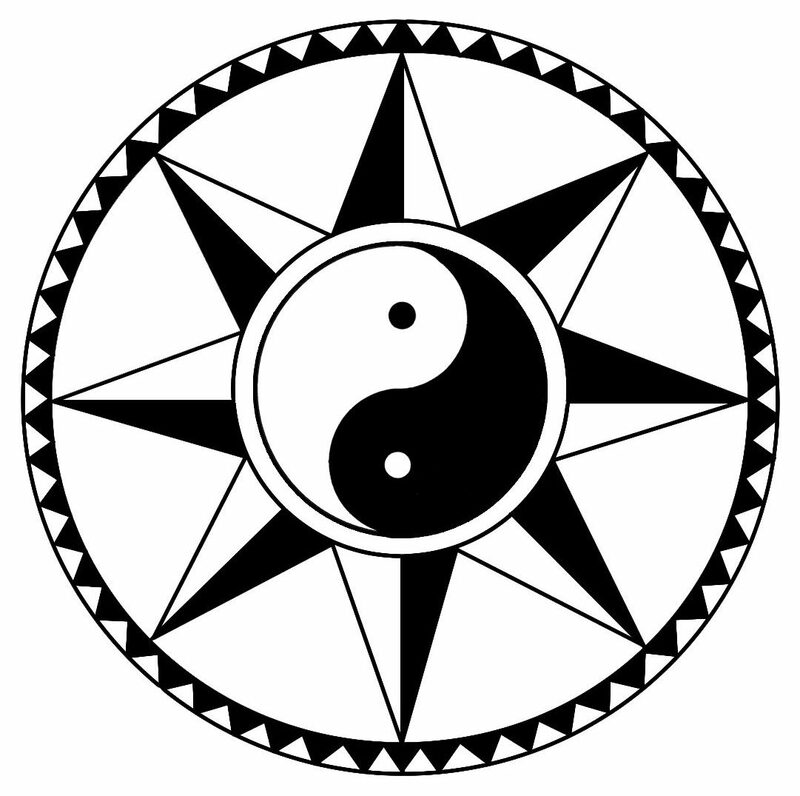 Each triangle is divided into black and white, reflecting a Yang (hard) or Yin (soft) attack or response respectively. Between the eight triangles can be seen eight further triangular segments pointing inwards representing a hard attack towards us. One of the Yin Yang triangles is used simultaneously to meet this force – the Yang part is to ground and the Yin part is to neutralise. The eight triangles also reflect the eight directions: North, South, East and West and the four corners. These are possible angles for both attack and defence and body motion. All points of the triangles are attached to a circle which upon contact will turn. These circles remind us of the four distances:- the outside circle would be kicking range, the next is punching range, then trapping range and finally grappling range. The outer circle, depicting the smaller triangles, is our total awareness to all of the sub-directions. It illustrates the interplay of Yin and Yang throughout our body as we become like a spinning ball in a constant state of flux. 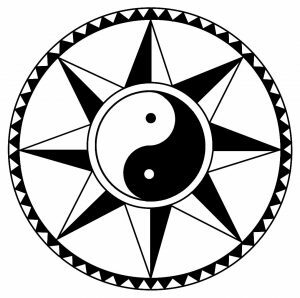 Lastly the Yin Yang symbol in the Centre of the Mon is to remind us to aim to internalise these concepts and never to deviate from our centre.It’s this principle and concept which is the central method of Shi Zen Do Karate. At Shi Zen Do we endeavour to provide boys, girls and adults of all abilities a professional, fun, safe and educational environment to learn and develop their martial art skills. 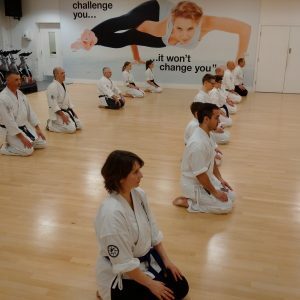 Our weekly training sessions are supported with regular martial art courses, covering applications to form (kata) self-defence and weapons, the weapons courses are subject to age and grade. Our team of Instructors are full licensed coaches and DBS checked delivering a high standard, inspiring confidence in the student to develop technical skills and understanding of the art. The four stages of student development.